This Barbie set is going to be one of those standout presents this Christmas. For many little girls, this Barbie DreamHorse set will last in their memories forever. And I’ll explain why. Girls love horses. And this is no ordinary horse. The Barbie DreamHorse is interactive. And no, it’s not just recorded sounds. You get a horse that responds to actions and touch with more than 30 realistic reactions. Can you imagine the delight your child will experience when the horse nods yes or no in response to her question. ⇒ For an excellent price on the DreamHorse, take a look here. The DreamHorse is a Barbie walking horse that will walk forward, do a 360 degree turn and even neigh to you. Your child will be thrilled when the horse nuzzles to them in response to touch. You can also “feed” the DreamHorse with the carrots included in the set and it will make a chomping sound. Can this Barbie walking horse entertain? 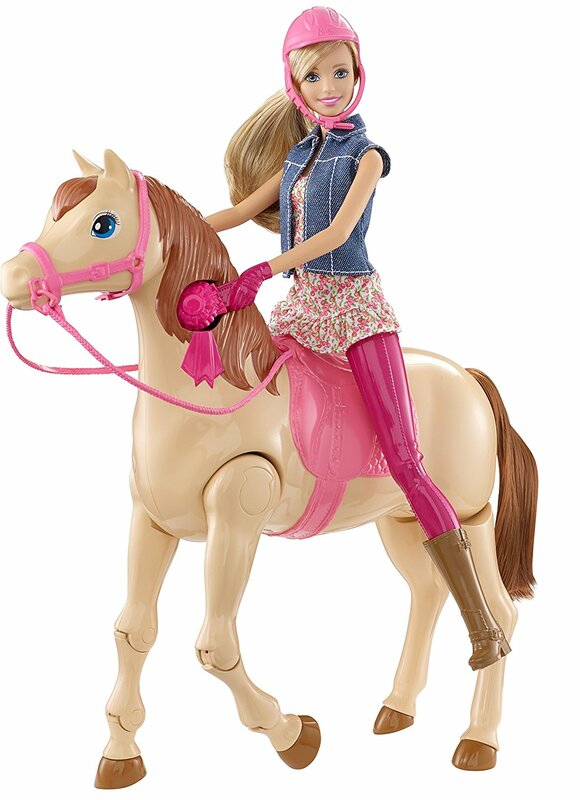 Barbie’s DreamHorse can play music and dance to three songs while Barbie sits securely riding. 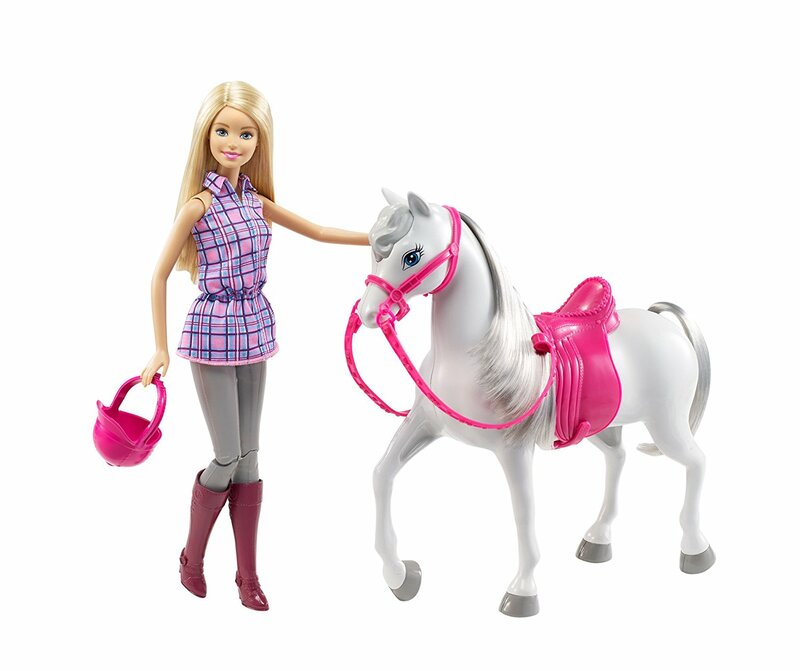 The horse’s saddle includes a waist clip for Barbie to enjoy riding and dancing along with her DreamHorse. If this all sounds very complicated, you might be concerned it’s all too much for a younger girl. This is not the case because the interactive settings are divided into three modes. Not surprisingly, this is what makes this Barbie walking horse different. It enables different play in each mode. The Barbie DreamHorse is recommended for ages 3 years and over. For children who love to play with Barbie’s wardrobe, you should know that the doll that comes with the Barbie DreamHorse set wears a pink riding top but the riding pants are molded and not removable. The pink helmet and brown riding boots are removable. Also, your little girl is going to love DreamHorse’s flowing mane. This is the longest mane on any of the Barbie horses. Consequently, the Barbie DreamHorse set comes with a grooming brush. It fits in Barbie’s hand. If your daughter loves animals, she’ll love playing with Barbie and getting her to groom the horse’s luxurious mane and tail. ⇒ To see the latest price on the DreamHorse with black hair doll, click here. 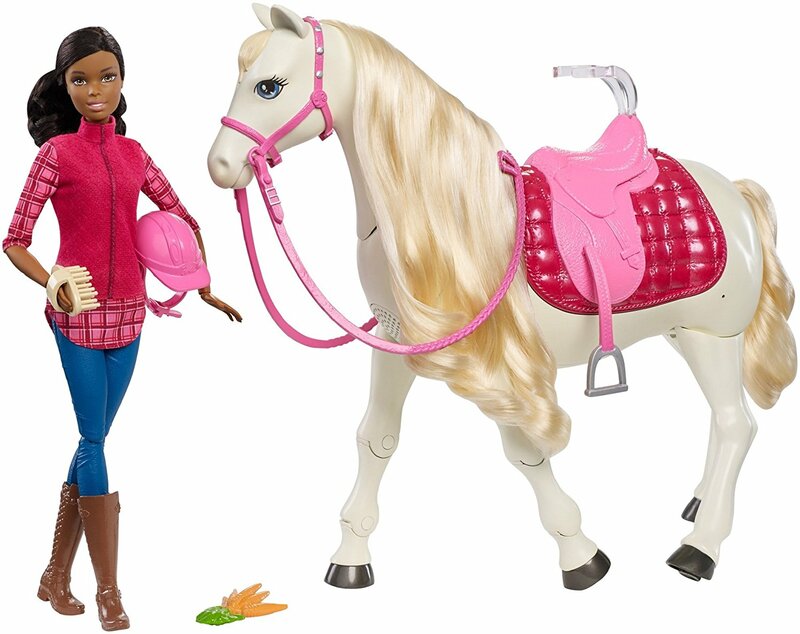 Mattel deliberately didn’t name this Barbie walking horse. Significantly, the reason for this is so your child can build a closer connection with the DreamHorse by naming it herself. This encourages imagination and creative play. This Barbie walking horse ticks all the boxes. 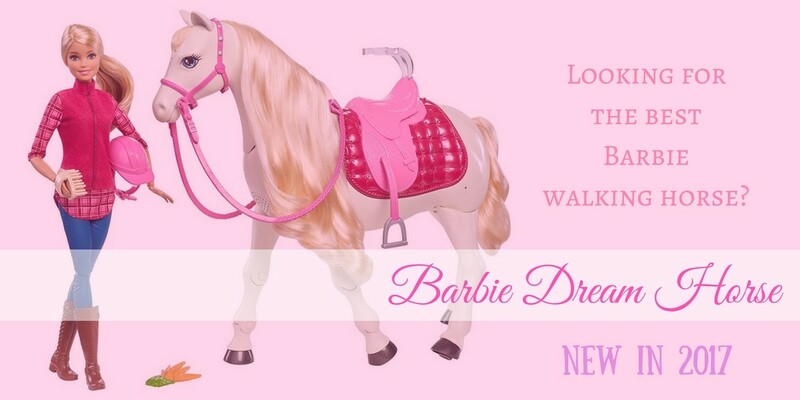 It’s got a cute Barbie with riding outfit, the horse is interactive to voice and touch, the set comes with accessories and you can select different modes for different play. If you want to give your daughter the hottest new toy for Christmas 2017 I suggest you take a look at Barbie DreamHorse. This is more than a toy, it’s an experience she’ll remember forever. The Barbie DreamHorse (above) is not cheap. There’s a reason for this. It’s interactive with three different modes and obviously that’s going to cost more. ⇒ To see more details on the Saddle ‘N Ride set, including price, click here. If you’re looking for something a bit more affordable but still battery operated, I think you’ll like the Barbie Saddle’N Ride Horse. This set includes the horse and Barbie doll. Now, here’s the exciting part. Barbie swings herself up onto the saddle and the horse walks on its own. Can you imagine it? By putting Barbie’s hand on a special socket on the horse’s mane, you can launch her up into the saddle using a child-activated mechanism. And then the horse walks automatically for about 8 seconds. It happens all in one action. This is the wow moment your child will delight in. Some people have commented that this toy is difficult for younger children to operate. But once they get it, they love it. It is recommended for ages over 3 years. If you’re buying for a 3 or 4 year old you may want to think twice about whether this is the best toy for the age. The toy is incredibly fun once you get the hang of it but if you think your younger child will struggle with it, there are other Barbie horse sets to consider. Here’s a video of the horse in action (above). Don’t you just love the way she jumps on by herself. Who wouldn’t love to play with this Barbie Saddle ‘N Ride Horse set! 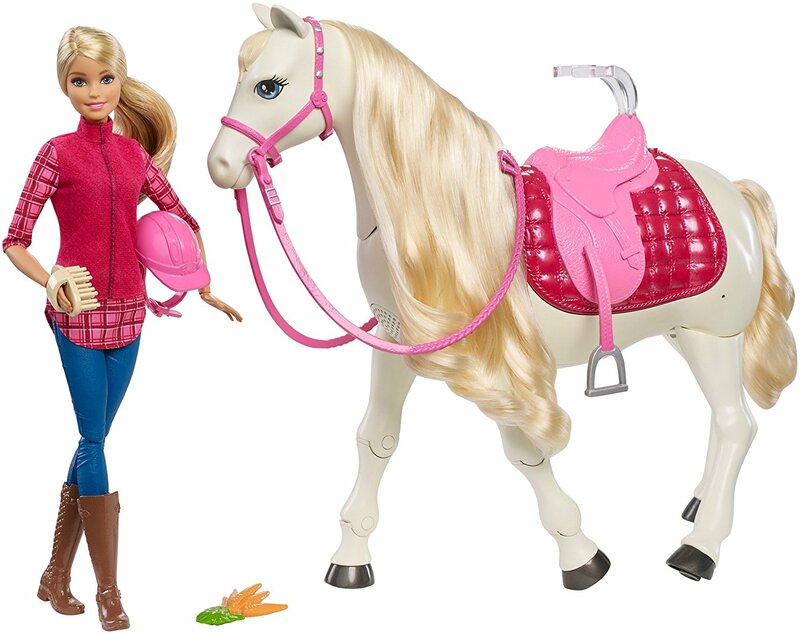 ⇒ This Barbie and Horse set is a more affordable option. See the price here. This Barbie Doll and Horse set is a much more affordable option. 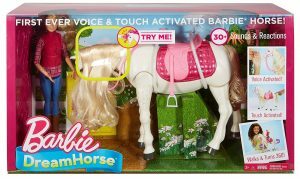 This horse does not walk but it’s a great alternative to the other two Barbie horse sets if you don’t want to spend too much. This is still a delightful toy that will bring hours of enjoyment to your child. There are no batteries involved. The Barbie with this set has bendable legs to sit on the horse properly and her hands slot into the reins to keep her secure when riding. This horse has a silver colored mane and removable saddle, bridle and reins. Barbie has molded riding pants, a fabric tunic, riding boots and a helmet. Barbie’s legs are bendable for riding but this Barbie can’t stand alone. This is usually not a problem with children because they like to “make Barbie walk” by holding her. This Barbie Doll and Horse set is great value for money. Most of all, this set encourages imaginative play at a reasonable price. Whichever Barbie Horse Set you choose, you know your child will enjoy many hours of creative play. Furthermore, the interaction between Barbie and the horse encourages imagination and communication skills. Your child will be delighted to receive one of these sets this Christmas. ☑ Looking for the Best Toys for Toddlers this Christmas? Here’s the info you need.